Our shop specializes in all types of piano services for modern, square, fortepianos, and other types of keyed instruments. When it comes to piano tuning, we have decades of experience tuning by ear combined with the latest computer technology. We also provide piano restoration services and the rebuilding of modern and historical instruments. Swenson's Piano Shop offers a full range of services for modern and historic pianos, including tuning, refinishing, and high-quality restoration. Instruments restored in our workshop can be found in many museum, institutions and private homes worldwide including the Smithsonian Institution in Washington, D.C. (photo), the University of the Arts in Tokyo (photo 1, photo 2), and the Schubert Club museum in St. Paul, Minnesota. The Beethoven Center at San José State University houses a fortepiano by Mathias Jakesch (photo) rebuilt in our shop. In the summer of 2007, we completed an unusual grand piano (photo), with "harmonic swell" built in 1822 at the London factory of Muzio Clementi. The instrument is part of the collection of the Granger Homestead and Museum in Canandaigua, NY. We have just completed the restorations of a rare fortepiano by the Viennese builder Conrad Graf (photo 1) and the Neapolitan builder Giacomo Sievers (photo 1, photo 2). We specialize in the restoration of grand pianos by Bösendorfer, Bechstein, Broadwood, Blüthner, Baldwin, Chickering, Conrad Graf, Ehrbar, Feurich, Ibach, Knabe, Pleyel, Steinway & Sons, Schweighofer, Mason & Hamlin, and Stein & Streicher. We restore, buy and sell modern and historical grand pianos, including 18th- and 19th-century Viennese fortepianos. We are happy to talk about pianos and we invite questions about sales, restoration, appraisals, conservation procedures, and long-distance moving. The prices for our work and our restored instruments are surprisingly low. Please don't hesitate to contact us if we may be of service in any way. Piano restorer and music history professor Edward Swenson graduated from the Oberlin Conservatory of Music with a degree in performance and a certificate in piano technology. During his junior year, Swenson participated in the Oberlin-in-Salzburg program. 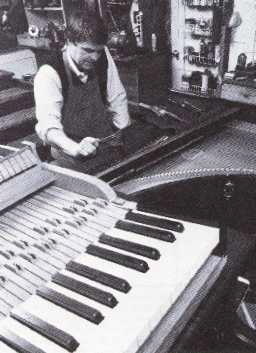 For two summers, Swenson worked as a piano technician in Chicago for Lyon & Healy, a Steinway dealer. After graduation from Oberlin, Swenson returned to Austria for two years with a scholarship from the Austrian Ministry of Education. He received a Master's degree in musicology from the Akademie Mozarteum in Salzburg where he was also awarded the Lilli Lehmann Medallion from the International Stiftung Mozarteum. After a year in Italy with a Fulbright grant, Swenson studied musicology with Donald Grout at Cornell University. He completed his Ph.D. with a thesis on the Italian composer Antonio Salieri. In 1970 Swenson joined the music history faculty of the Ithaca College School of Music. While teaching at Ithaca College, Swenson also served for several years as a piano technician for Cornell University. 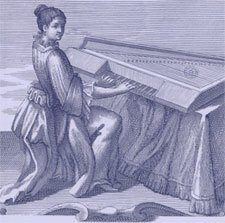 Swenson is a member of the American Musical Intrument Society, the Mozart Society of America, and the Historical Keyboard Society of North America. Swenson is a RPT (Registered Piano Technician) in the Piano Technicians' Guild. He has contributed numerous articles to the Guild's professional Journal. Fortepianos and pianos restored in Swenson's workshop are located at the Smithsonian Institution, the University of the Arts in Tokyo, The Schubert Club Museum in St. Paul, MN and in numerous other private and public collections. He has also contributed articles about piano history, restoration, conservation to professional music journals and encyclopedias.